Inspired by my friends at Toymaker Television, I decided to build an interactive Cat toy thingy. 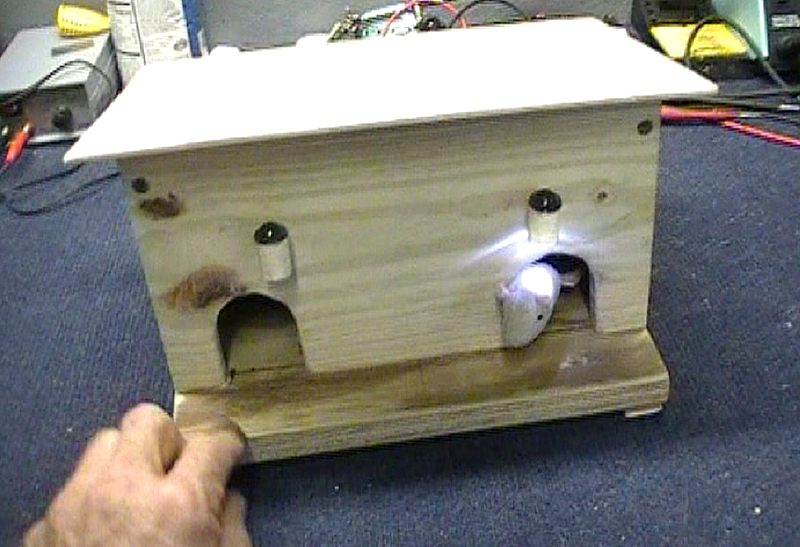 After some thought, I figured that a toy mouse poking it’s head out of a hole might be fun. When the Cat whacked at the mouse, it would disappear inside the hole and then another mouse would pop out of a nearby hole! This could be lots of fun for a Cat! So, then I thought about how to make all this happen. 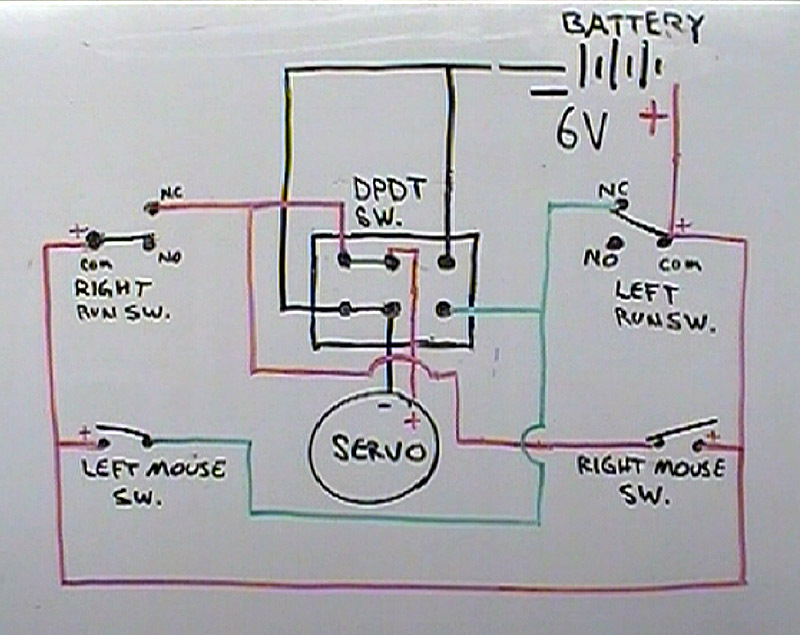 At first, I thought about using a micro controller and some sensors, but no, as usual I wanted it to be simple. After some more thought I realized that I could do it all with a few switches and a pivoting lever, and so, I got started making a plan. Now, when I plan something. I literally sleep on it. Things just come to me in my sleep, or I’ll wake up with a solution to a problem. That’s how this project got designed… I slept on it for a few days. After I had a solid idea in mind, I sat down with pen and paper and a few drafting tools like a divider, a ruler, a circle template and a pencil. I drew out a design, then made a working 2D model of the mechanism. 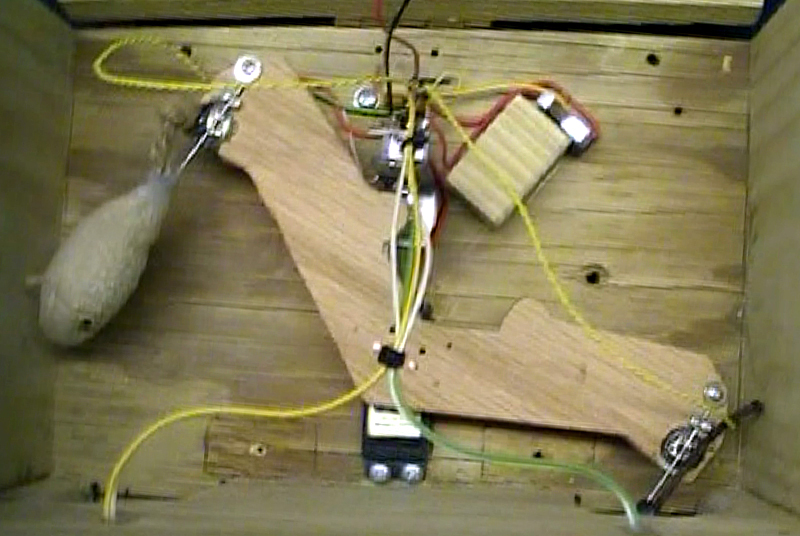 Once I worked out all the details, I built the heart of this device, the central lever that holds the two mice and functions as an actuator for several switches. I decided to use an RC servo to do the work so I opened one up and modded it to free rotate past 180 degrees, and wired it direct to the motor, Basically, I turned it into a gear reduction motor. Then it was time to put it all together, which took about 10 hours over two sessions at the bench! A lot more time than I would have estimated, but there were several problems that came up that had to be solved. That’s what rapid prototyping is about. Solving problems quickly. Along the way I made a few changes and additions. Finally, I had a working device. Time to let the Cat, Seamus, have at it…. Talk about an anti-climax! He was not only disinterested in it, he was a bit freaked out by it and didn’t want to be near it! What the hell? Mouse filled with Cat Nip… interactivity… nope. Seamus would rather just go sleep. Ahh Kittehs! Not to be let down, I let Sophie the Dog have a go at it. She was pretty excited about the ball launchers so why not! Well, she loved it! As you’ll see in the video, sometimes projects end up working differently than you had planned, or even thought of. It’s not a failure… it’s a surprise and a realization that your project has more applications that you had originally thought of, or conceived. Bonus! Cats are fickle beasts. I think it’s the noise from the motor that might scare most cats off, although it does sound somewhat mouse-like to my untrained ear. It looked like Sophie was about to do a tear-down at one point, she was clearly trying to figure out how to open it up. Smart pup. I bet a Jack Russell Terrier would adore this. You should mass produce them and sell them to an animal shelter charity :).